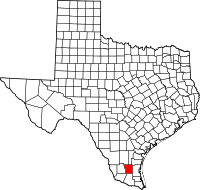 Brooks County is a county located in the U.S. state of Texas. As of the 2010 census, the population was 7,223. Its county seat is Falfurrias. The county is named for James Abijah Brooks, a Texas Ranger and legislator. The county faces a range of challenges due to immigration issues. Though it lies about 80 miles north of the border, it is a main route for illegal immigrants crossing from Mexico. The open dry terrain and hot summer temperatures cause many immigrants to die annually, leading some to dub the area a "Death Valley" for migrants. According to the U.S. Census Bureau, the county has a total area of 944 square miles (2,440 km2), of which 943 square miles (2,440 km2) is land and 0.3 square miles (0.78 km2) (0.03%) is water. As of the 2010 United States Census, there were 7,223 people living in the county. 89.6% were White, 0.5% Black or African American, 0.3% Native American, 0.3% Asian, 7.9% of some other race and 1.4% of two or more races. 91.2% were Hispanic or Latino (of any race). As of the census of 2000, there were 7,976 people, 2,711 households, and 2,079 families residing in the county. The population density was 8 people per square mile (3/km²). There were 3,203 housing units at an average density of 3 per square mile (1/km²). The racial makeup of the county was 75.84% White, 0.19% Black or African American, 0.46% Native American, 0.09% Asian, 0.08% Pacific Islander, 21.58% from other races, and 1.77% from two or more races. 91.57% of the population were Hispanic or Latino of any race. There were 2,711 households out of which 38.90% had children under the age of 18 living with them, 52.20% were married couples living together, 19.10% had a female householder with no husband present, and 23.30% were non-families. 21.40% of all households were made up of individuals and 11.30% had someone living alone who was 65 years of age or older. The average household size was 2.92 and the average family size was 3.38. In the county, the population was spread out with 31.60% under the age of 18, 8.90% from 18 to 24, 23.40% from 25 to 44, 21.70% from 45 to 64, and 14.40% who were 65 years of age or older. The median age was 34 years. For every 100 females there were 94.20 males. For every 100 females age 18 and over, there were 89.90 males. The median income for a household in the county was $18,622, and the median income for a family was $22,473. Males had a median income of $23,051 versus $16,103 for females. The per capita income for the county was $10,234. About 36.90% of families and 40.20% of the population were below the poverty line, including 51.70% of those under age 18 and 30.40% of those age 65 or over. While the state of Texas has become a stronghold of the Republican Party in the 21st century, Brooks County rests in the oldest extant Democratic stronghold in the state. It has never voted for a Republican presidential candidate since its creation in 1911. No Republican has received more than 35% of the vote in the county since Richard Nixon in his 1972 landslide, and no Democrat since George McGovern that same year has received less than 65%. McGovern is one of only two Democrats, the other being Adlai Stevenson in 1956, to have received less than 60% of the vote in Brooks County since it first participated in presidential elections in 1912. The only instance of Brooks County having ever cast its votes for a Republican was in 2010, when Comptroller Susan Combs won it during her reelection, as no Democrat filed to run. ^ Saslow, Eli. "Going it alone". www.washingtonpost.com. The Washington Post. Retrieved 10 August 2014. ^ "2010 Comptroller General General Election Results". David Leip's Atlas of U.S. Presidential Elections. Brooks County in Handbook of Texas Online.